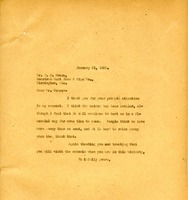 Martha writes to let Mr. Moore that she is sending literature and would enjoy having him for a visit at Berry. 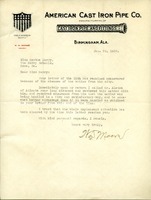 Mr. Moore writes to Miss Berry to request information on the Berry Schools on behalf of a Sunday School teacher from the Sixth Avenue Presbyterian Church. 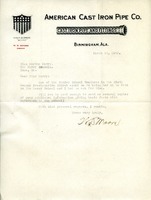 In this letter W. D. Moore apologized to Martha Berry that her letter had not been responded to sooner and assured her that the situation was being handled in a satisfactory way. 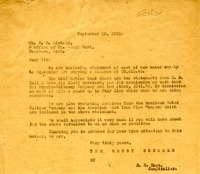 This is a letter from the comptroller of The Berry Schools(E.H. Hoge) to Mr. E. G. Liebold regarding a statement of cost of the water supply for Berry Schools. 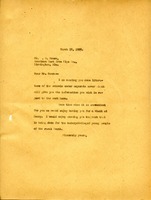 The comptroller seems to be requesting a check for the amount mentioned in the letter from the office of Mr. Henry Ford. Martha Berry writes to Mr. Carson at American Cast Iron and Pipe Company about whether or not The Berry Schools should put a dam in at their water source because it is currently insufficient so they have to turn to city water. She asks Mr. Carson to come down to look at the water supply. She says that since Mr. Egan was so interested in The Berry Schools that she feels sure the company will be happy to help her.